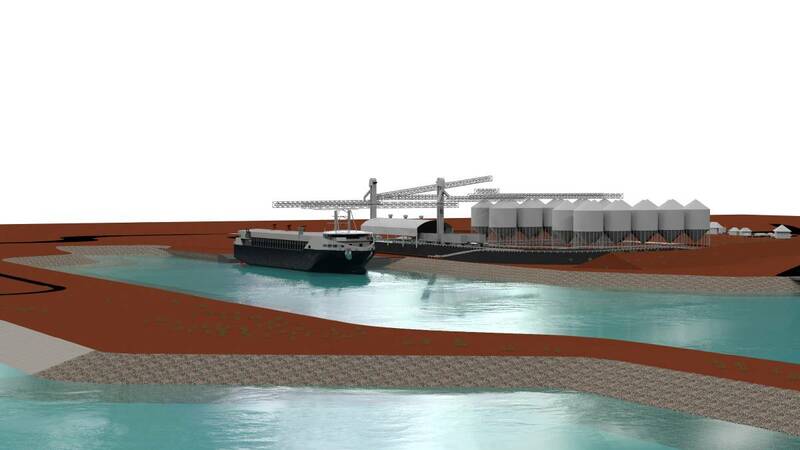 Image: An artist’s impression of the proposed Lucky Bay grain port. The tiny town of Lucky Bay on South Australia’s Eyre Peninsula will house a brand new grain port valued at $115 million, thanks to the State’s first farmer and private equity partnership. Consortium T-Ports raised $96 million in private investor equity for the project that includes port infrastructure and supply chain components. The Lucky Bay shallow harbour port will be used to transport grain to deep-water vessels further out at sea. The project also includes funding for 430,000 tonnes of grain storage at the port and a further 150,000 tonnes of storage at Lock. A transhipment vessel – with the capacity to hold 3,500 tonnes of grain – is currently being built in China. The state of the art vessel will be used to load Panamax vessels out at sea and within the usual five-day industry standard. Local grain growers were consulted during an expression of interest phase last year, with 120 growers indicating their support for the project. These growers will acquire equity in the port for ongoing throughput over the next seven years, with 377,000 tonnes forecasted to be processed through the port’s facilities. In addition to improved grain prices through increased local supply chain competition, growers are expected to save between $5 and $20/tonne on grain transport costs, depending upon the distance from farm to port. The facility will also open up opportunities for fertiliser to be delivered to Lucky Bay, representing savings of between $25 and $40/tonne for farmers currently purchasing from Port Lincoln and Adelaide. Construction work will start immediately, with a promise by T-Ports that it will be ready and open to receive grain for the coming 2018/2019 harvest. Grain Grower Isaac Gill from Mangalo said the development of the report would help to make harvest logistics easier, as well as boosting profitability. “It’s fantastic because we are going to save off our bottom line extra freight which we have been doing down at Port Lincoln and we can’t often deliver straight to port at harvest time’. ‘Now we will be able to deliver it straight off the header, straight out of the paddock and straight to port and it could be saving us around $15 a tonne’, he said. ‘It will be a real game changer for a lot of growers in our area’.